I can't believe this little series is up to it's tenth post! Pretty neat. 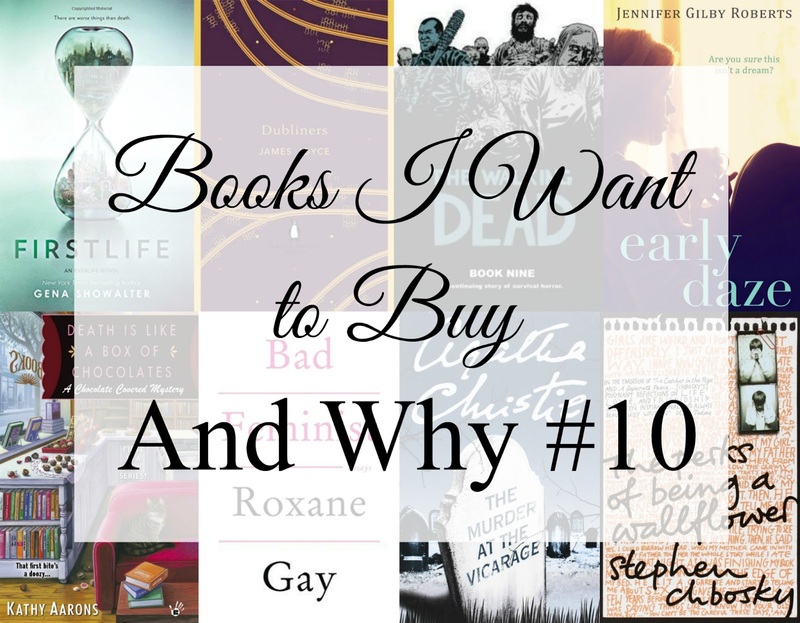 Books I Want to Buy and Why is where I tell you about eight books I want to buy and why I want them. I find it really helps me prioritise when I write exactly why I want to read them and my readers always have great insight into what is worth getting. You can read the rest of the series here! I knew I was in trouble the minute I saw that cover. Look at it! Firstlife is about a world where the afterlife is really important and these two realms want the main character and are fighting over her or something. I'm not too sure. All I know is that it has one of the most beautiful covers I've ever seen and I've heard great things about Gena Showalter in the past so I'm more than willing to give this a go! I was looking at the reading list for my future modules and Dubliners jumped out at me as I already had it on my Penguin English Library wishlist! I'm a sucker for a pretty cover and that rubber-y finish on a book, but also, this story really appeals to me. I love Dublin, I love the time period, I'm pretty positive I'll at least like this book. As you may know, I've been re-reading my The Walking Dead comic books and while I have the twelve issues in this hardcover in singles- I'd like the hardcover as it's much easier to read and it'll just look so nice on my shelf. I don't know why I cringe at the price so much when the individual issues are £2.20 each. I've had this on my wishlist for at least two years. It's a novella about having a premature baby and life when you're a mother of a baby in the NICU. It just sounds like something I'd really enjoy reading, as someone interested in the whole having babies thing but not at all ready yet. And I don't think I've heard of any other book covering the topic. Anyone who knows me, knows that I love chocolate with a fiery passion. And I love cosy crime novels. And books in general (obviously). So a cosy crime novel based in a book/chocolate store... It's the book of my dreams! In all seriousness, nothing has filled the gap that Aurora Teagarden left. But I'm hopeful. After a questionable exploration into being a Hot Feminist, I'm ready to see what it takes to be a Bad Feminist. I've heard a lot of great things about this collection of essays and I'm on the look out for some non-fiction where I can actually get past that 50% mark. I have never read an Agatha Christie book. I know. I just always wanted to start at the beginning and when I was a kid it was a lot harder to figure out the order of novels. But as an adult, I have the internet, Amazon, and way too much free time apparently. I saved every Agatha Christie book and made a note of what order they were. This is the first Miss Marple and I am so ready to start this journey. In a conversation with my soulmatepal, they recommended this book to me as it's their favourite. And I take peoples favourite books very seriously. Admittedly, this has never really appealed to me before, maybe because I'm older than the coming-of-age audience, but I've heard great things. What books are you hoping to but soon? Have you read any of these?